The Menendez Paradox: Facing Charges After Testifying Against Corruption : It's All Politics The senator who once testified against a corrupt mayor is facing his own federal corruption charges. Sen. Robert Menendez on his way to the Senate floor for a series of votes last week. Sen. Bob Menendez, who came up in the sharp-edged politics of Hudson County, N.J., has been under varying levels of ethics scrutiny in seven of his nine-plus years as a senator. He'd never been indicted — until yesterday. The indictment landed like a chunk of loose concrete from Hudson County's Pulaski Skyway: 14 counts alleging travel, vacations and contributions in exchange for the kind of clout a senator can wield in Washington. Justice Department prosecutors called it a bribery scheme. The indictment says Salomon Melgen, an ophthalmologist in West Palm Beach, Fla., gave Menendez free travel on a private jet, vacations and hefty political contributions, they allege. In return, the indictment says, Menendez did favors for the doctor, and in four instances, for the doctor's girlfriends. That is plural — girlfriends. Melgen was also charged with 13 counts of his own. Menendez insists Melgen is an old friend, not an operator who extracted favors from an obliging lawmaker. That's an important legal defense on the gifts he received. Menendez is also likely to invoke the Constitution's Speech or Debate clause, which bars the prosecution of representatives and senators in their official business. He said he'll fight — words that he's used before in his political career — and vowed, "I'm not going anywhere." The indictment lists gifts and contributions totaling nearly $1 million. The largest slice is $600,000 to a Democratic Super PAC, which spent it to help Menendez win re-election. Melgen also gave $40,000 to the Robert Menendez Legal Expense Trust — a certain irony there — plus contributions to his campaign committee. Melgen flew Menendez on his private jet, and they vacationed together in Paris and Melgen's villa in the Dominican Republic. Menendez fought to get Melgen off the hook for overbilling Medicare by $9 million. In 2012, Menendez arranged a meeting with then-Senate Majority Leader Harry Reid and Kathleen Sebelius, then secretary of Health and Human Services. In January 2013, just as he was assuming chairmanship of the Foreign Relations Committee, the FBI conducted a document raid on Melgen's office. That ended a calendar year in which it appears Menendez was not being investigated. The indictment also says Menendez pushed for tourist and student visas for three girlfriends of Melgen, and the sister of one of them. And on a third matter, Menendez went to administration officials — and in July 2012 called them to testify at a Foreign Relations subcommittee — over the Dominican Republic government's refusal to do business with a port security company co-owned by Melgen. 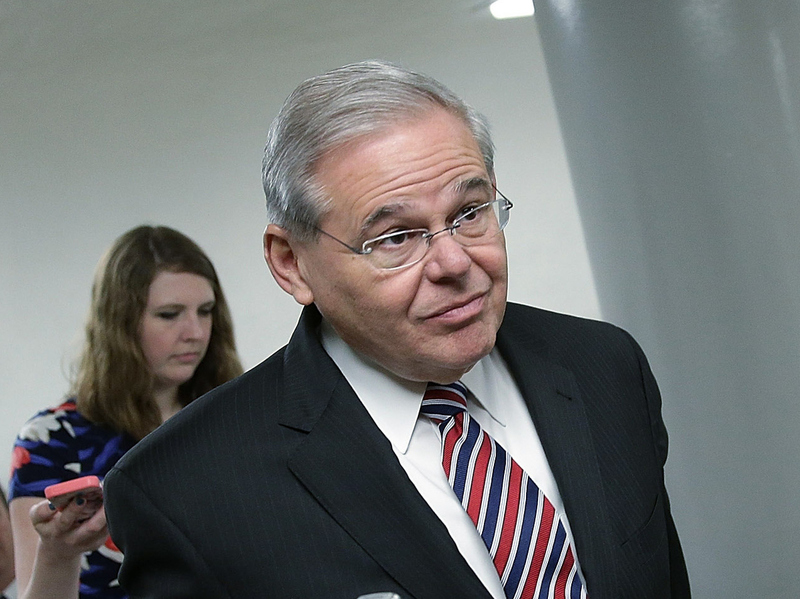 The Dominican Republic angle developed from a scandal that didn't happen – allegations that Melgen and Menendez had had prostitutes at the villa. One of the women recanted the story, and it died. But, like the raid on Melgen's office, it created the trail leading to yesterday's indictment. Previously, various federal prosecutors looked at Menendez for five years, in connection with a nonprofit organization and a hospital in Hudson County. Chris Christie, then the Bush-appointed federal prosecutor for New Jersey, issued the first subpoena in September 2006, less than two months before Election Day. The case quickly dominated the Senate contest, in which Menendez was seeking to keep the seat he'd been appointed to earlier in the year. He won, and Christie went on to be elected governor. Neither of the cases ultimately touched Menendez. He was informed that the probe was over in October 2011. But here's the Menendez paradox: None of these investigations fit with his first time dealing with federal prosecutors. Thirty years ago, Menendez was a protégé of Union City Mayor Billy Musto, a power in Hudson County and New Jersey politics. The feds went after Musto for racketeering, extortion and fraud, and put him on trial in 1982. Menendez, the son of Cuban immigrants, wore a bullet-proof vest as he testified against Musto. The mayor went to prison. The former protégé later became Union City mayor, a power in local and state politics, a congressman and a senator. And now, he is the first sitting senator charged with bribery since 1980.